Winter is nearly here… that’s how the saying goes, right? Something like that anyway, because Game of Thrones is all about weather. We’ve been waiting seven seasons for the much-hyped winter to arrive, and now season eight is almost here it means we get to finally see what a winter in Westeros really looks like. Not that we need reminding because, after all, we know what the other side of the wall looks like. It’s looks hella cold and hella winter-y. A bit like Canada but with more undead White Walkers making their way south. 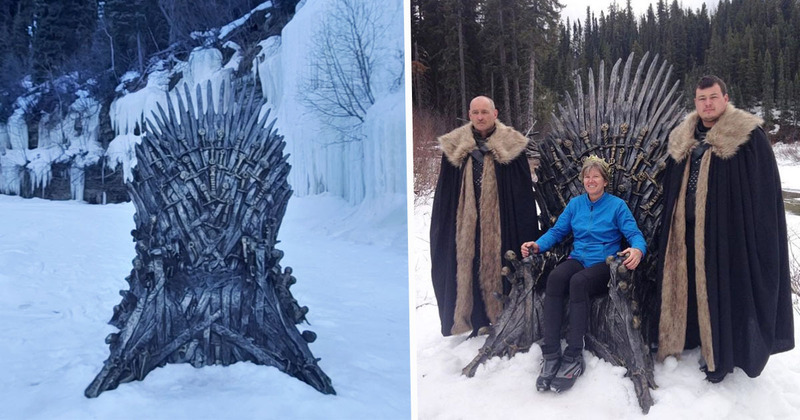 Which makes it fitting that a couple in Canada just found one of HBO’s Iron Thrones hidden away on snowy Tumbler Ridge, in British Columbia. In the run-up to the highly-anticipated eighth season of one of the most epic TV show of all time, HBO have dotted six Iron Thrones across the globe for fans to find. And if they do stumble across the hefty seat, they win… eternal pride, or something like that. Until now, only four of the thrones had been found. Now, however, a fifth has been found in Canada, so there’s only one left! Quick! The throne was found by Kevin and Birgit Sharman. Kevin works with the Tumbler Ridge UNESCO Geopark Society, and the pair were headed off on a cross-country ski when a reporter called and asked Kevin about the ‘geographical features’ of the area, after they had heard about the GoT contest. People had started to piece it together that [one of the thrones] might be in the Tumbler Ridge area. After speaking to the reporter, it didn’t take long for Kevin to deduce almost exactly where the throne had been placed. My wife and I headed out pretty much right away … and as we drove up, we could see the throne sitting there right beside the creek! As they approached the throne, they were met by two men dressed in fur capes, so Kevin – naturally – explained he and his wife were there to pop a squat on the throne. He kind of nodded like that was the right answer. I think there’s some kind of protocol for the contest or the show. So far, the other thrones that have been found were in Puzzlewood, England; Björklinden, Sweden; Castillo de Atienza, Spain; and Beberibe, Brazil. The clues to the sixth and final throne are set to be revealed later this week. Couple finds coveted Game of Thrones throne in Tumbler Ridge, B.C.